This blog post was started on Valentine’s Day, with love for our home community, the Lower East Side of New York City. On that day, our director was campaigning for more street trees and a local stewardship initiative to bring more nature into our lives. Our home community is the Lower East Side, which has 165,000 residents and a real shortage of parks, street trees and greenery. According to the City's terrific map of street trees, tree-map.nycgovparks.org, our community board district, CB3 - the LES, Chinatown and East Village - has just 5,000 Street Trees. Trees are so beneficial! We all appreciate the leafy shade and singing birds plus these 5,000 provide us with $600,000 in energy conservation, CO2 reduction, storm water capture and pollutant removal, all of which help mitigate climate change and protect our health. That's $120 per tree per year. Wendy's campaign is focused on this simple statement: let's get moving now on planting more street trees and reinvigorating tree stewardship. On Valentine's Day Wendy Brawer made a short statement and her draft Resolution was accepted and adapted by CB3 on February 26, 2019! Download the LES Community Tree Canopy Resolution below, share the link at bit.ly/CB3trees19 - more about this exciting campaign is to come. Green Map NYC has also been part of the Stanton Building Task Force, working in coalition to return a long-closed community center in a nearby Park to active use. Good news! New bathrooms are finally getting underway! 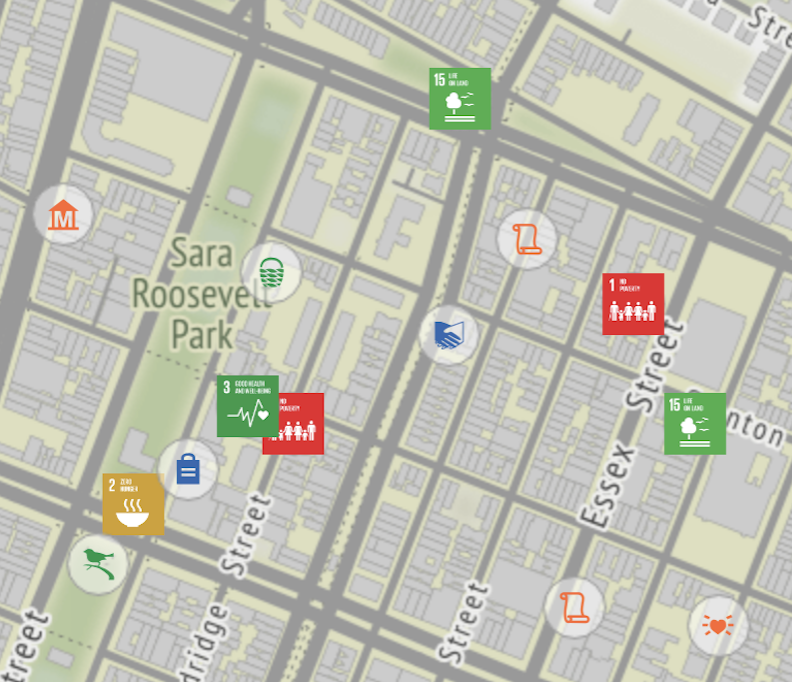 We’re in the process of creating a new Green Map that includes the Stanton Bldg and mixes in the UN 2030 Sustainable Development Goals as markers. Made on what we are calling OGM2 - a remarkable mapping platform being built by Bogdan Szabo - there's a peek of this platform above, with a link to explore it to come. Our Director is also taking part in the new East River Alliance, which formed this winter to address the City’s new plan that could ‘bury the park in order to save it”. Surely, there is an ecologically sound way to deflect climate change impacts while supporting the needs of this diverse community! Join us Sunday morning, May 5th for our East River Park Jane’s Walk to see what’s at stake in person. We're taking part in the School of Data on the opening day of Open Data Week NYC - join us March 2, with our lightning talk, pechakucha-style at 5:30pm!